Began training at Flying Dragon Taekwon-Do, LTD under Mr. James Hewes. Promoted to first dan black belt (ITF/KATU certificate A-1-9210 ) November 11, 2000 by Mr. James Hewes, 4th dan. 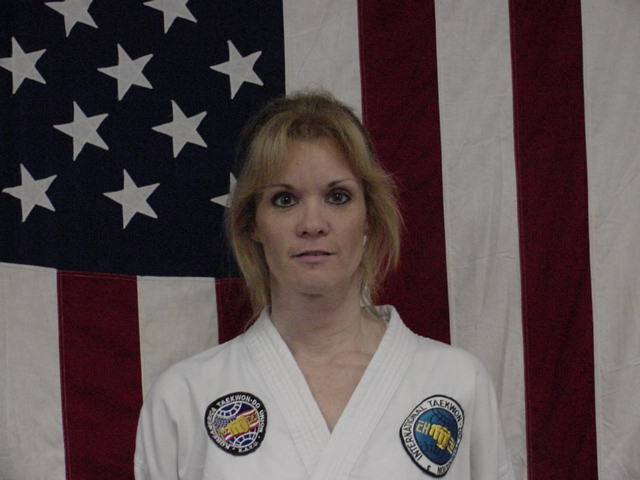 Promoted to second dan black belt (ITF/KATU) July 20, 2002, by Grand Master K.S. Hwang, 9th dan. Promoted to third dan black belt (UITF) , by Grand Master K.S. Hwang, 9th dan. 2000 - present: Began assisting with classes and training beginning students. Team Leader for the TKD Club Annual MS Walk for a Cure. September 24, 1998 attended technical seminar conducted by Master Sang H. Kim, 7th dan. October 9, 1999 attended Annual KATU Technical Seminar conducted by Grand Master Rhee Ki Ha, 9th dan. October 29-31, 1999 completed 158th ITF International Instructor Training Course (certificate number 158-46). March 4, 2000 attended Technical Seminar conducted by Master Choi Jung Hwa, 8th dan. July 16, 2000 completed KATU/ITF Certified Referee and Instructor Training Course (certificate number 000716). October 14, 2000 attended Technical Seminar conducted by Grand Master K.S. Hwang, 9th dan. December 2, 2000 attended Technical Seminar conducted by Grand Master K.S. Hwang, 9th dan. September 29, 2001 attended Technical Seminar conducted by Grand Master K.S. Hwang, 9th dan. October 12-14, 2001 completed First Inaugural ITF International Instructor Training Course conducted by Master Choi Jung Hwa, 8th dan. December 1, 2001 attended Technical Seminar conducted by Grand Master K.S. Hwang, 9th dan. October 19, 2002 attended Technical Seminar conducted by Grand Master K.S. Hwang, 9th dan, Clayton, DE. 1997 - FDTKD Annual Summer Camp, Smyrna, DE, participant. 1998 - FDTKD Annual Summer Camp, Smyrna, DE, participant. 1999 - FDTKD Annual Summer Camp, Smyrna, DE, participant. 2000 - Hwang's Annual Summer Camp, Barre, MA, participant. 2000 - FDTKD Annual Summer Camp, Clayton, DE, participant. 2001 - Hwang's Annual Summer Camp, Barre, MA, participant. 2001 - FDTKD Annual Summer Camp, Clayton, DE, participant. 2002 - Hwang's Annual Summer Camp, Barre, MA, participant. FDTKD Appreciation Award, December 1998. 2000 International Choi Cup - Bronze medal in patterns. CPR/First Aid Certifide thru American Red Cross.